Before coming to Wild Blue, I was the furthest thing from being an animal lover. I never had any pets growing up, and, frankly, I always thought cats were aloof and obnoxious! But in early 2017, I had the opportunity to babysit a sweet, loving and playful cat who turned my negative attitude about cats upside down on its head. Now, I wanted to meet more cats and learn more about them! I found out about Wild Blue through an online search and joined the sanctuary’s socialization team. 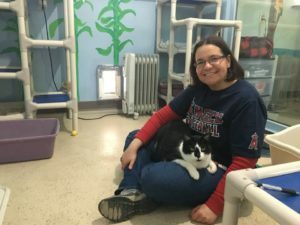 For the past year and half, I have been coming to the sanctuary once a week to visit with the cats, play with them, and give them love and attention. That has proven to be a wonderful way for me to meet all kinds of kitties and get more comfortable around their various personalities and behaviors. This past summer, I also started fostering kittens which was, again, a whole new experience for me. Admittedly, I was a little scared at first! But I quickly fell in love with the adorable little balls of fur that bounced into my house. I wanted to do everything possible to make sure they grew up to be healthy and happy kitties who would then become best friends to their eventual adopters. I have since fostered several groups of kittens, each one different than the other, but all precious and worthy of finding forever homes. I am blessed to be a part of such a wonderful organization, and I look forward to helping save many more lives in the coming future! 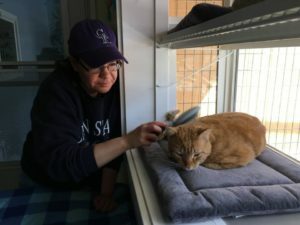 PreviousPrevious post:Meet our volunteers of the month – Ted & Julie Driver!NextNext post:Oklee, our super sweet big guy!